This morning I went to Christies Auction House for the viewing of the upcoming auction items. It is a great way to see art that is rarely on display since it usually goes from one private owner to another. 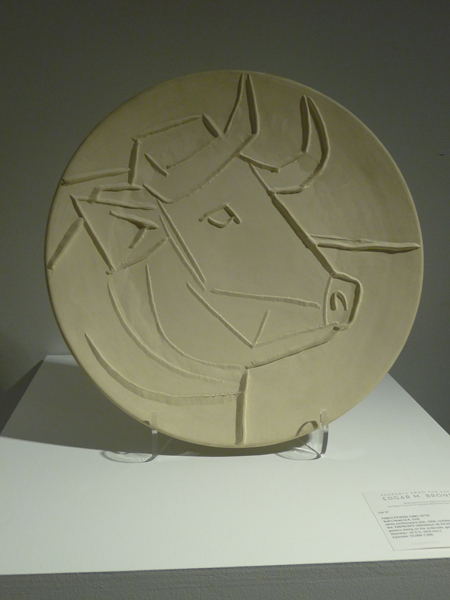 I went to see the upcoming exhibit of Prints and Multiples, but chose to draw a Picasso ceramic to remember my visit. This is my photo of the 16.5" diameter plate. 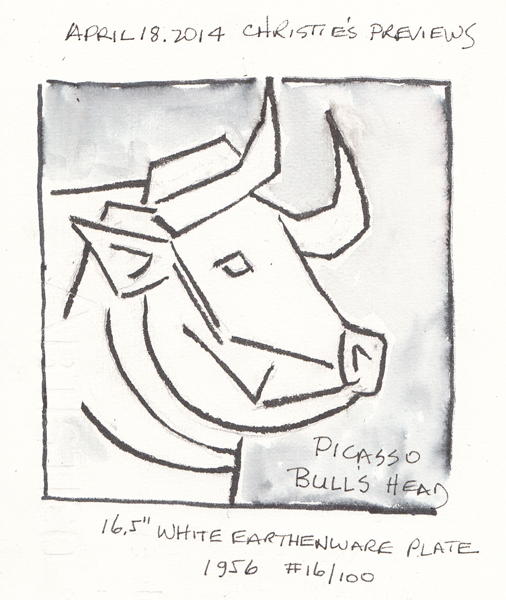 I love the simplicity of Picasso's lines and frequently copy them trying very hard to embed his techniques in my brain. My drawing was done with a Pentel Pocket Brush Pen. 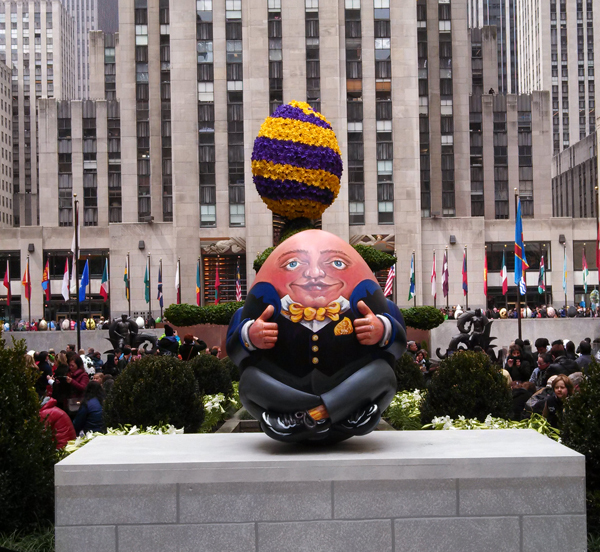 I forgot that there were several hundred artist eggs placed around New York City and found dozens of them displayed around the Rockefeller Center Skating Rink as I walked to Christies. 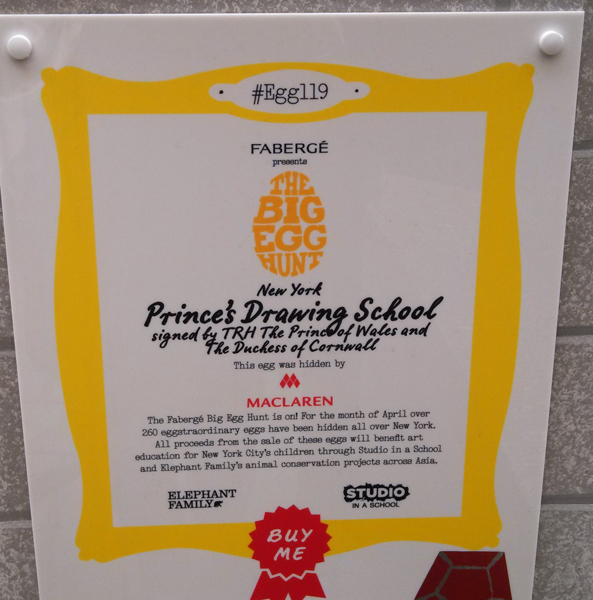 The "Big Easter Egg Hunt" in NYC is sponsored by Faberge, and the artists range from the famous, i.e. Jeff Koons to local public schools. Here is my favorite egg. It was done by the Prince's Drawing School and is signed by Prince William and Princess Kate. 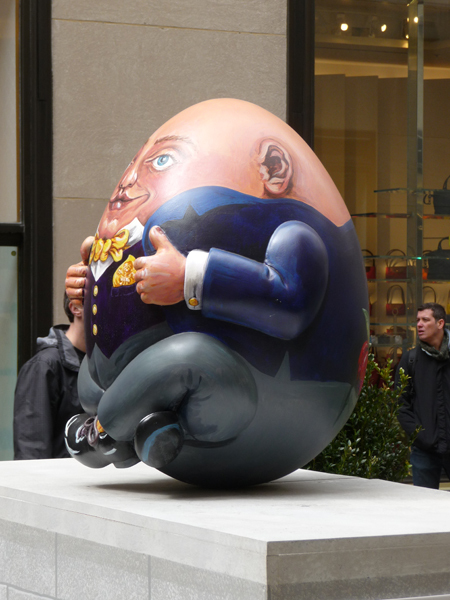 As I type this, the current auction bid for Humpty Dumpty is $16,000. We spent last weekend celebrating the Bar Mitzvah of Daniel who is one of our closest friends' grandson. We met his grandparents in 1969, even before Daniel's father Ben was born. His birth may be one of the factors which made us more ready to start our own family. 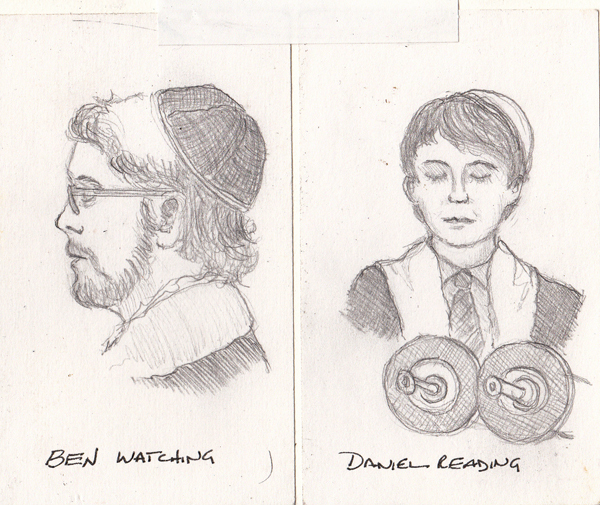 I did these 2 portraits on blank 3 X 5" cards with a disposable mechanical pencil that was in my purse - while listening and watching the service. They are now collaged on a page in my sketchbook to highlight the lovely event. My oldest grandson was singing in the Middleschool Choral Festival on Wednesday. 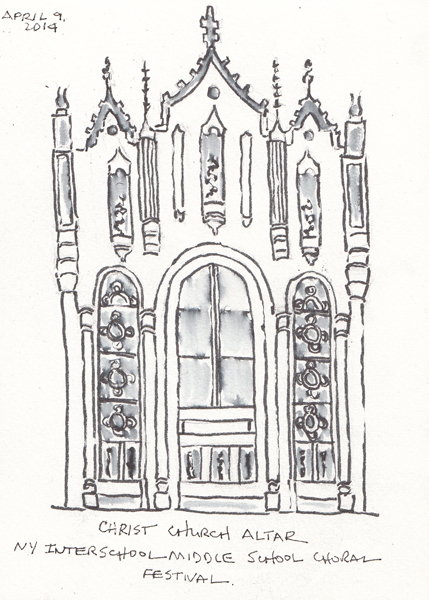 I arrived early and listened to each individual school practice and sketched the center altar in the church they were using for the concert. I sketched in pencil, then Tombow black marker, and then added water with my waterbrush. Yesterday I went to see two exhibits with my friends Bendicte and Pat. There is an amazing exhibit at Neue Galerie on Degenerate Art as designated by the Nazis and featured in Munich in an exhibit of the same name right before WWII. Many of the works shown at Neue are done by my favorite German artists. 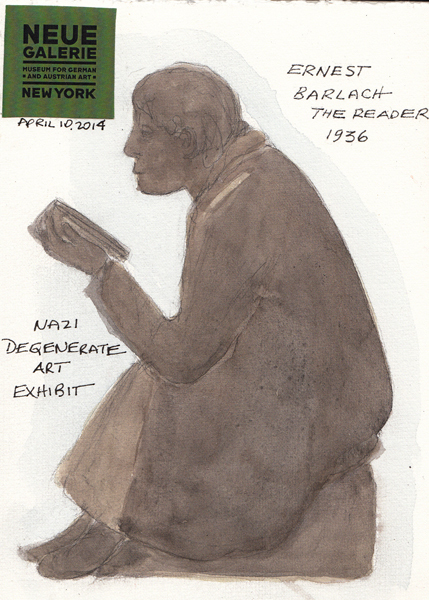 I sketched a sculpture by Ernst Barlach called "The Reader." It was considered "degenerate" because of the book which they considered the sign of an intellectual! 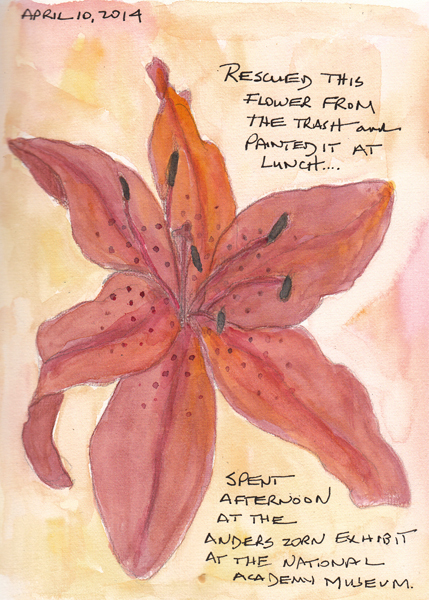 On our walk up Madison Ave to lunch I found this beautiful bloom at the top of a trash can and took it to paint during while we ate. 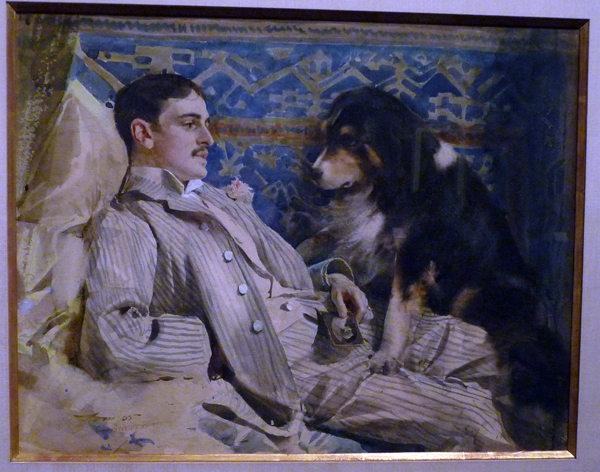 We spent the afternoon at the National Academy Museum seeing an exhibit by the famous Swedish Artist Anders Zorn. 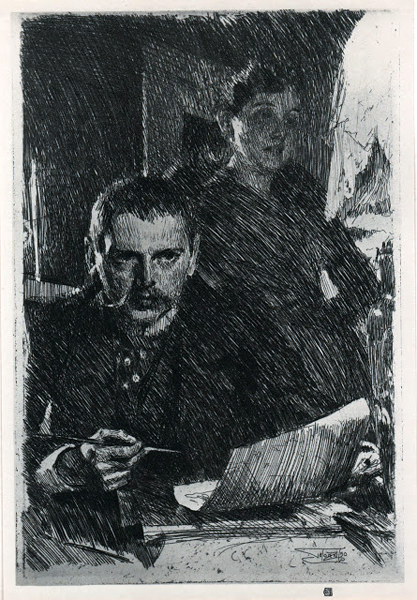 His etchings and watercolors were brilliant and I'm posting photos, not sketches - which would have been impossible. 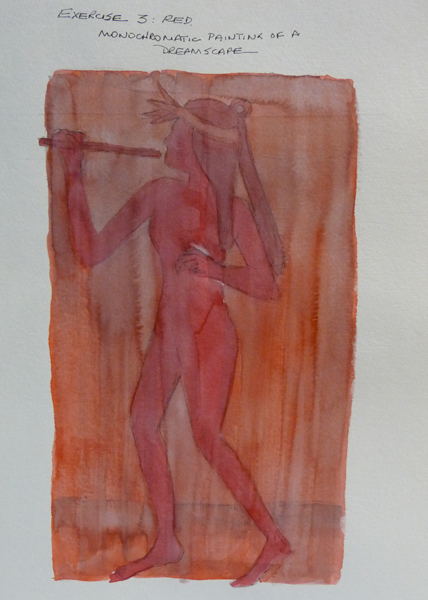 A Zorn Watercolor (from my photo): This also appears in the link I included. 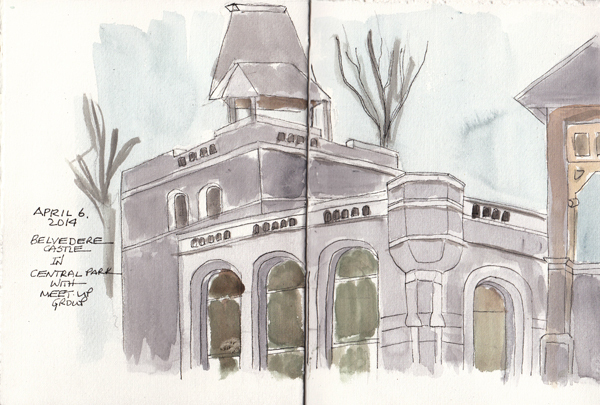 Yesterday we had a gorgeous day for outdoor sketching and our group met at Belvedere Castle in Central Park. We had approximately 45 minutes to move to location, sketch, paint, and then gather to show our sketches. Over 3 hours we shifted position 3 times and here are my 3 sketchbook pages. Belvedere Castle - from the rocks overlooking Turtle Pond. I sat in bright sunlight and listened to tourists search for the turtles - both swimming and sunning themselves below us. Instead of working more on my castle drawing, I sketched and painted another member of our group during the 2nd session. 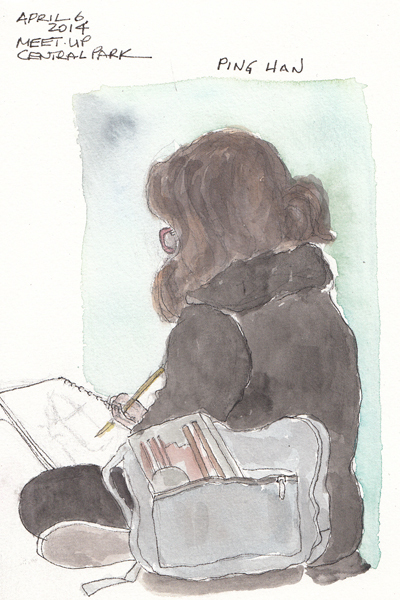 She had beautiful hair which fell naturally, covering her face while she was drawing. But I could always see the frame of her red glasses. 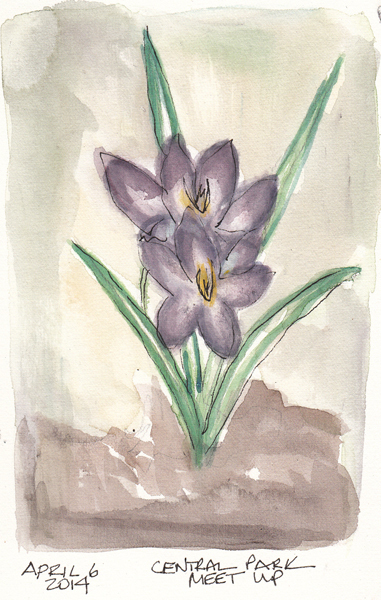 We moved to The Shakespeare Garden for our 3rd session and I fought with a painting of a very small purple flower - one of the few that were blooming. I couldn't capture the exact purple color or show the variation from intense color at the ends of each petal to white in the center. I tortured these 2 small blooms - and finally said - "I did my best and have lots more to learn." 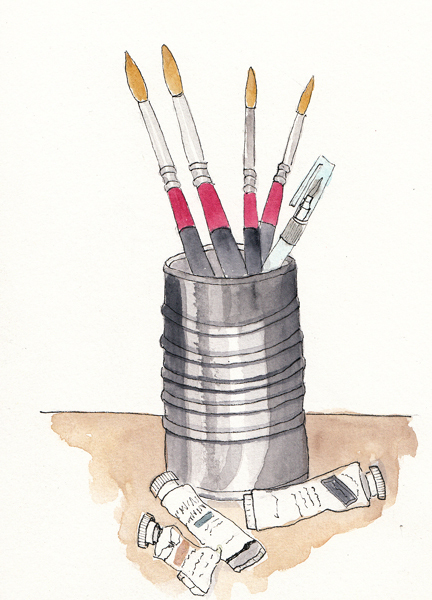 Before I decided to enroll in the "Studying Under the Masters" Online class this winter, I bought Veronica Lawlor's book One Watercolor a Day so I could play with loose watercolor exercises during the dark winter days. 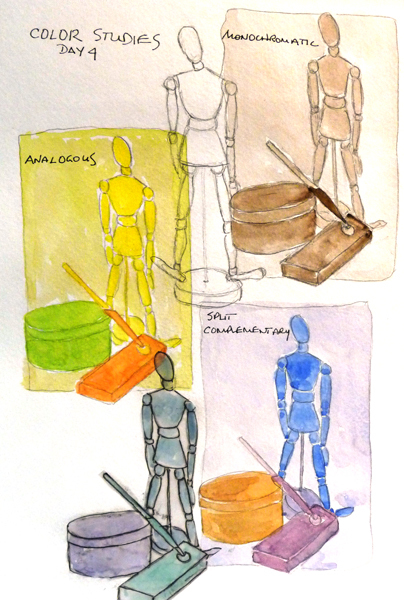 It is designed for 42 days (6 weeks) and this week I started the book and did 4 exercises in my 9 X 12" 140 lb Watercolor Strathmore Visual Journal. Here are exercises from 2 days. I was inspired by a mosaic in the Lincoln Center Subway stop and used scarlet red, permanent alizarin crimson, and these mixed with gold gouache and Payne's gray. 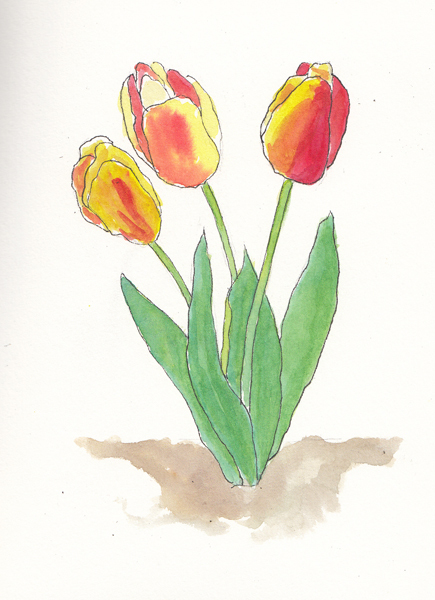 The rest of the days I painted tulips twice - trying to paint the petals wet-on-wet - and one brushes/paint still life. We are so ready for Spring in New York City - and yesterday the tulip plants in front of my apartment were 3-4 inches high. 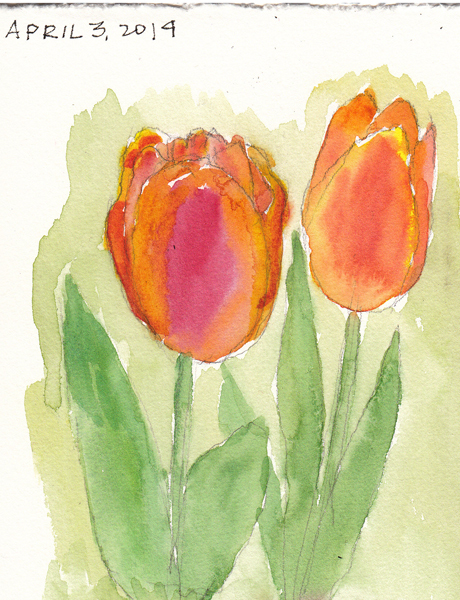 I painted this week from tulip photos that I took last year.